The coupon, which originated in the early twentieth century, is a marketing gimmick which is traditionally issued by CPG manufacturers in order to provide consumers with a discount or rebate on various products. In 2016, there were a total of 307 billion coupons distributed throughout the United States. Of the 307 billion coupons distributed throughout the country, only about two billion were redeemed in 2016. The average face value of food free standing insert (FSI) coupons in 2017 was around 1.22 U.S. dollars, and about 2.29 for non-food FSI coupons. 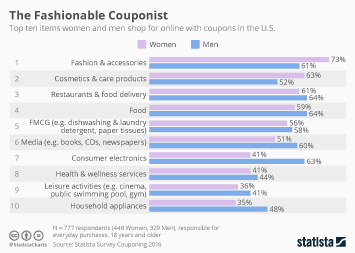 According to an August 2016 survey, the most popular sources for finding digital coupons in the United States were websites or apps that aggregate coupons, followed by e-mail newsletters. Among regular users of coupons, about 64 percent frequently redeem coupons for food at restaurants or brick-and-mortar retail stores. Total value of distributed CPG coupons in the U.S.